Jaime C. Moore is a photographer and artist currently based in Austin, Texas. She is married with two children. 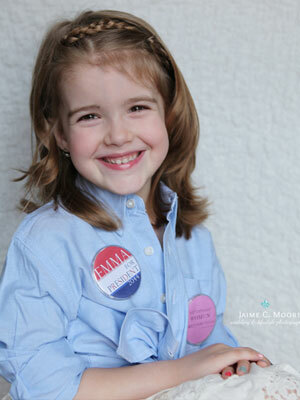 To celebrate her daughter Emma’s fifth birthday in 2013, Jaime commemorated the occasion by taking a series of pictures. Looking to move beyond portaits of fairy-tale princesses, Jaime decided to seek out better role models with her daughter, and together they selected five real women that Emma could aspire to be like. She then set about replicating iconic portraits of Emma posing as Coco Chanel, Amelia Earhart, Susan B. Anthony, Helen Keller and Jane Goodall. These form the inspirational series “NOT just a girl”. The resulting portraits she created attracted media attention around the world. You describe photography as being about capturing “your authentic connections and genuine emotions”. Please could you tell us more about what you mean by this and when you first became interested in photography? I have (officially) been a photographer for about five years now, but have always had a camera in my hands. I am a fan of anything art, I am drawn to it but photography is my main love. For me there is just something about capturing a single moment in time, that then becomes yours forever, that seems so powerful. I always try my best to photograph people in true, real moments, trying to capture their true reaction and emotion on film. Freezing that one fleeting moment forever. Real moments from a real life that goes by too quickly, suddenly frozen forever in a single image that you can hold in your hands. Who are the photographers you most admire? Oooo that is a long list, but just to name a few, Annie Leibovitz, Kyle Thompson, Sue Bryce, Brandon Stanton and Kirsty Mitchell. You are an artist and a photographer. What other media do you work in? I also dabble in graphic design and oil paintings. What gave you the idea for “NOT just a girl”? I really wanted to do something different this year for her five year portraits. Five is such a fun age, the age you realise your little one is not so little anymore. She has begun to think for herself with her own opinions and questions about the world around her; it’s pretty amazing. I had been searching everywhere for new-creative inspiration for her five year pictures. I noticed quite a pattern of so many young girls dressing up as beautiful Disney Princesses. No matter where I looked 95% of the “ideas” were how to dress your little girl like a Disney Princess. It started me thinking about all the REAL women for my daughter to know about and look up too, REAL women who without ever meeting Emma have changed her life for the better. How did Emma react when you suggested the idea to her and how did you go about identifying the women in the photos you would emulate? Emma is a very creative and independent girl herself. I had mentioned several times about needing to photograph her five year portraits and when I proposed the idea of doing something completely new, she was so excited. We had so much fun picking out the costume pieces and through each woman’s portrait. I would tell her about each incredible woman. Learning of Amelia Earhart seemed to be her favorite (although Jane Goodall was a close second). Just the idea of her dressing like the first female pilot to fly across the Atlantic and Pacific Ocean thrilled her. I love her facial expression in the photograph, I took the shot as I was cheering “Emma you just flew a plane, by yourself, over the Ocean!” In her eyes I see so much pride and confidence. I love seeing that come through an image and it means so much more seeing it in my daughter’s eyes. What impact did social media have on the story spreading? A large one! The Series has now been shared hundreds of thousands of times, it’s pretty incredible. How did Emma feel about becoming famous around the world? What has the demand for your work been like since? Honestly I think if I could make three of me right now, only then I could feel productive. I am thrilled to be receiving so much inquiry and demand for my work and I have so many ideas that I am so excited to explore and share but I also have two little ones to love and care for. They will both be in school full time this fall which will give me a little bit of breathing room to balance life between work and mothering. In the media, you were quick to say that you weren’t ‘anti’ Disney princesses, but that you wanted to encourage Emma to think beyond stereotypical fairytales. How can other parents look beyond traditional role models for their children? I think in our society a lot of us have forgotten the real trail blazers that have shaped our children’s lives for the better, especially in media and advertising. We glorify movie stars and cartoon figures, which we are able to purchase bedsheets and dolls of and see in daily posters and ads. We live in a day and age where almost any information of history we can be found at our finger tips; just sharing information about what these historical figures did in their lives and how it has influenced ours, can be a great experience for both child and parent. Add in a little dress up and you have their full attention! I hope for a day where we visit the mall (local store, etc) and see Amelia Earhart or Madam Curry dolls and colouring books. “NOT just a girl” was quite a birthday present. How do you go better this for future years?! Our plan is to continue the project each year. It was such a great bonding experience for both of us. What does Emma want to be when she grows up? That changes daily. Right now she seems to go back and forth a lot between “People Doctor” and “Veterinarian”. How can you reassure her that it’s OK to continue be herself? In everyday life and love. The whole point of the series was to show her that these women did incredible things in their lives so she can now do or be anything in hers. They broke society’s rules and stereotypes to follow their dreams and, if she chooses, she can too. Emma is an incredible person, sweet and caring, I know no matter what path in life she chooses she will be a wonderful woman and friend. I have so many ideas and plans to share with you all, my hope is to continue to grow as a person and artist.